First Church strives to provide a Sunday School setting where our children can learn to explore their faith and to see God in their daily lives. We seek to help our children have a positive experience, learn and understand about Jesus and the Bible, and foster a sense of service and concern for others. Sunday School is offered for children in preschool through 8th-grade, and runs from the Sunday after Labor Day through the second Sunday in June. Each week, Sunday School begins when the children are excused from worship following the Children’s Message (or Communion on the first Sunday of the month). Together with their teachers, they walk over to their classrooms in our Parish House and remain in class until 11:15 am. There, the children encounter a Bible story and/or a spiritual lesson through interactive activities like games, projects, crafts, and drama. Our classes are led by teaching teams of adults, who may be assisted by one or two teen helpers. Our youngest children (birth – age 2) are lovingly cared for in our nursery by experienced staff and parent volunteers. For those that may miss Sunday School on occasion, please know that First Church has access to Sunday School curriculum resources online for parents to download directly. 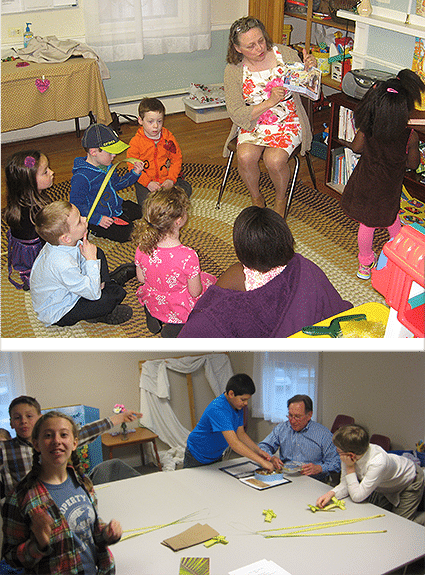 To access this content please visit the Kids Sunday School website using First Church’s common credentials. You can ask Lynette (carneyl@aol.com), Trish (trishwalton65@gmail.com) or Margaret (fcch@tds.net) to provide the login credentials. Also thinking of summer camps? Check out the wonderful camp programs at NH’s UCC accredited camp, Horton Center. For information on Horton Center sessions, click here.